ACPO has today launched a number of new posters featuring Mickey Bushell MBE, one of the fastest athletes in the world. Mickey Bushell delighted the UK population at the London Paralympics when he won the 100m T53 gold medal, he is also the world record holder in the event. 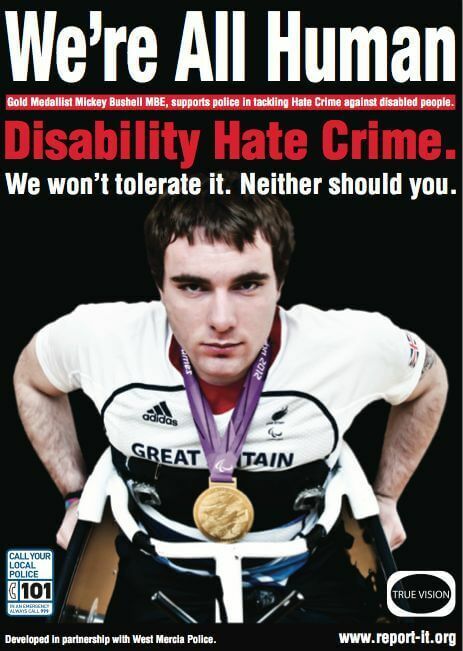 Now Mickey has given up his time to become the face of a new scheme to raise awareness of disability hate crime. The scheme, which was developed by West Mercia Police and their partners has even been used to cover local buses to increase public awareness. Ann Shaw who is the Equalities Advisor to West Mercia Police said "We are delighted that Mickey was willing to allow us to use his images to send a message that we will not tolerate disability hate crime, he is a hero to many of us and his endorsement of our activity will help people to recognise the message and encourage victims to come forward"
The local scheme has now been adapted and made available for all national partners to deploy locally. They can even be downloaded and used by local community groups. 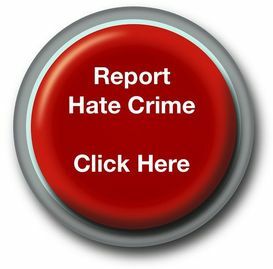 Superintendent Paul Giannasi who leads the ACPO hate crime website 'True Vision' said "The police recognise that many disability hate crimes are not reported, but we are committed to reducing the harm they cause. Mickey Bushell is a hero to many of us, he will doubtless give more victims the confidence to report crimes, but he is also a man with abilities and achievements that the rest of us can only dream of. Concentrating on our abilities rather than disabilities will also help to overcome the hostility that fuels hate crime. We are really grateful for his support and will encourage all partnerships to benefit from this excellent local police initiative." The posters can be viewed and downloaded here.